The Curacao Punch is a tasty cocktail outlined in the classic New and Improved Bartender’s Manual, which was originally released in 1882. 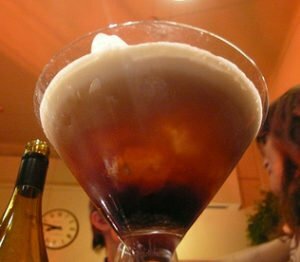 An almost forgotten cocktail, this drink should make a resurgence in the craft cocktail scene due to the complexity of the flavours. High end hotel bars should also look at bringing this old rum and soda cocktail back to their lounges for patrons to enjoy. This cocktail should ultimately be prepared in a goblet. A hurricane glass will also do in a pinch. Combine Sugar, Lemon Juice, and Soda. Stir to Dissolve. Fill goblet with crushed or shaved ice. When preparing this cocktail, you want to spend the extra time stirring the sugar with the lemon juice to ensure it is completely dissolved. With any cocktail, make sure you adjust both the sugar and lemon to taste. After adding your main spirits, and your soda… give it all a good stir to marry the flavours together. This drink could almost have it’s contents added to a shaker tin, then be dumped in a glass. Float the cognac on top of the drink. This is a 4 ounce drink, and beyond what can legally be served in British Columbia… but for home consumption you can do whatever you want. While you are getting creative, get fancy with the garnishes on your Curacao Punch. Here we say an orange and a cherry, which then matches with the orange flavoured liqueur. Have some fun with it.